Homemade biscuits, made from scratch, are easy to do. Yet, they take a somewhat humble bowl of soup, and turn it into a meal that the whole family is thrilled about! At least that’s the way it is here in the Boonies. Maybe it’s that way at your house, too. These particular biscuits are a savory biscuit, light and fluffy, tangy and flavorful, and they’d go great as an easy-to-make accompaniment to a pot of your favorite soup. I was trying to think of a story to go with biscuits, and the one I remembered is from my childhood summer vacations to Kentucky, where my Mom’s parents lived. My grandmother and my aunt, who lived next door to each other, both made biscuits for breakfast whenever we visited. They were all the more memorable because my Mom almost never made biscuits. My aunt made plain biscuits (no pepper, no chives) that we slathered with butter and either honey, Bob White syrup, or best of all, chocolate gravy. Chocolate Gravy is a chocolate sauce thickened with flour and butter, and it’s devastatingly delicious. I haven’t had it since I was a kid. But enough about biscuits as dessert. Let’s get back to biscuits as a savory. These biscuits are super easy to make. The buttermilk gives them a tang (and makes them tender) and the cornmeal in them gives them a great crunch. This recipe has more sugar than most biscuit recipes, which aids in browning, and balances the slight tang from the buttermilk. The chives add a little “green” which is slightly sweet, slightly savory, and a little herbal. The heat from the pepper adds a little zing. Taken altogether, the whole is greater than the sum of its parts. These biscuits have a nice balance of flavors and textures. 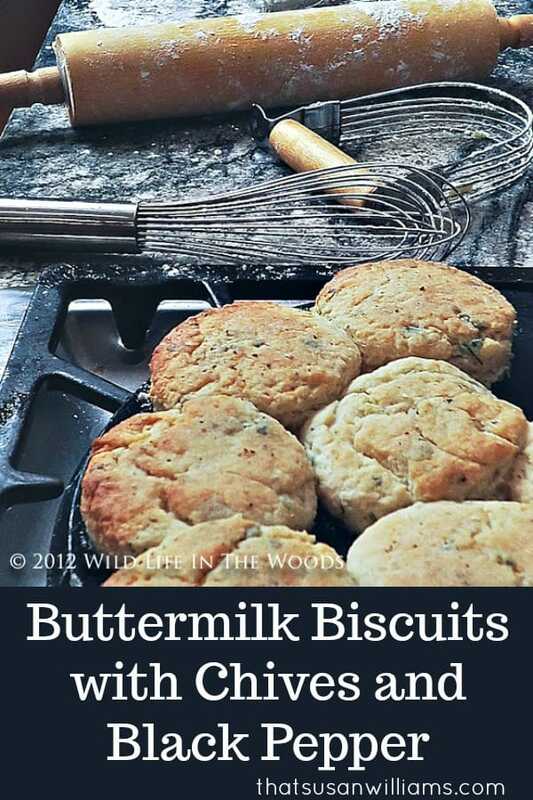 This image of Buttermilk Biscuits with Chives and Black Pepper is perfect for pinning on Pinterest, so that you don’t lose track of it! If you have no buttermilk, you can do what I do and sour some milk in a cup by adding a scant tablespoon of white vinegar to the 3/4 c. of milk. If you have no chives, you could certainly substitute green onions. If you have no self-rising flour, you can make your own, by adding 2 t. of baking powder, and 1 t. of salt to 2 c. of all-purpose flour. Tip #4 Does the type of flour you use matter, anyway? Tip #5 Something I do that makes these biscuits EXTRA good, and it has to do with a grain mill. If you happen to have your own grain mill, and can grind your own popcorn, cornmeal that is freshly ground tastes the very best, and is slightly more coarse, which is a desirable quality in this recipe. That’s what I use. Whenever I grind popcorn to use in polenta, or cornbread, I store any excess or leftover quantities that I’ve ground in a ziplock in the freezer. That way I always have some extra on hand for coating the bottom of a pizza crust, or to use in these biscuits! 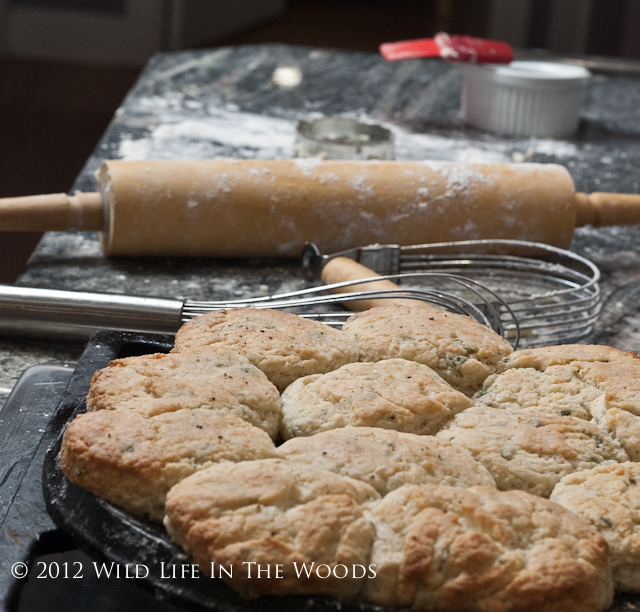 Buttermilk Biscuits with Chives and Black Pepper are easy, even though they’re homemade, from scratch. They make a humble bowl of soup a special meal. Spread a little melted butter on them when they come out of the oven. Pre-heat oven to 425º, with rack positioned in center. If using a baking sheet, line with parchment paper, or grease. (I cook my biscuits on a cast iron griddle pan, so, no parchment paper or greasing necessary.) Combine buttermilk and chives in medium bowl. Whisk flour, cornmeal, sugar, and 1/2 t. ground black pepper in large bowl to blend. Add butter cubes, and rub in with fingertips or cut in with pastry blender, until mixture resembles coarse meal. Add buttermilk mixture and stir until moist clumps form. Gather dough together. Turn dough out onto floured surface and knead gently just to combine, about three to four turns. Roll out to 3/4" thickness. Using floured 2"cookie or biscuit cutter, cut out rounds. Reroll scraps and cut out additional rounds. Place 2" apart on prepared baking sheet or griddle. Brush tops of biscuits with melted butter, and sprinkle lightly with pepper. Bake until golden, about 20 minutes. Spread tops with more melted butter, if desired. Because...hello? Biscuits need butter! Be sure to pin this one, or print it out, so you’ll remember to make them later. (And I have four scrumptious soups that would pair nicely with these delicious darlings, so click on these links, and check them out, too! They are: Slow Cooker Tortilla Soup, Lentil Soup with Kielbasa, Baked Potato Soup, and Minestrone with Pesto. Are you a biscuit lover?